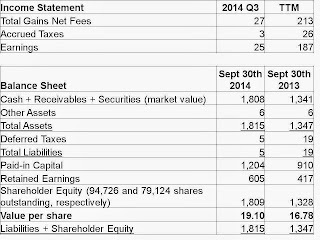 For the third quarter ended September 30th, 2014, KVF earned $0.32 per share, increasing the value of each share to $19.10. The headline number flatters the portfolio's performance, however, as currency gains added $0.46 to this quarter's results. As such, without these currency gains, the overall results would have been slightly negative. 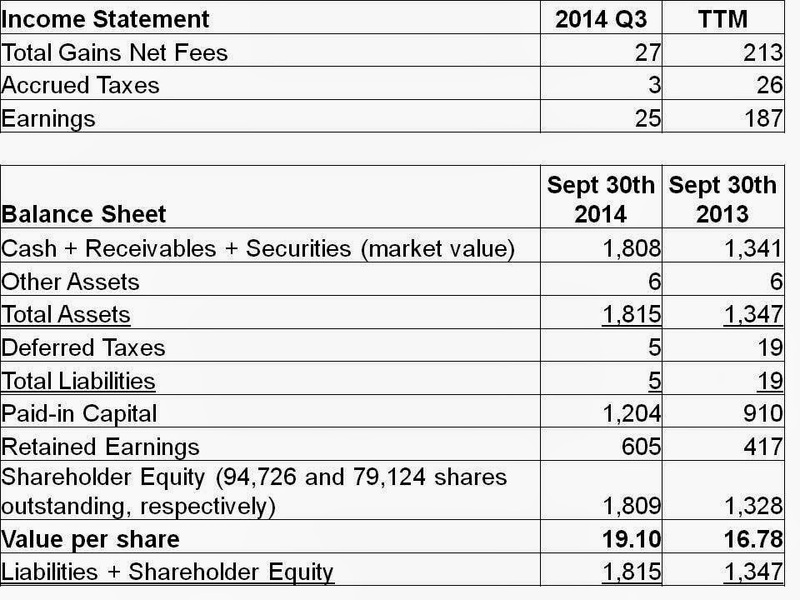 While KVF's absolute performance this quarter was not good, its relative performance was not bad. The S&P 500 eked out a gain of less than 1% for the quarter, while the S&P/TSX was down just over 1%. The index that best describes KVF's investment set is likely the Russell 2000, which was down on the order of 8% this quarter. Notably, this index is now also down on a year-to-date basis. The fund's portfolio has recently benefited from price gains in the shares of Best Buy, which have now been sold. While I believe the company remains somewhat undervalued, now that the company's price has significantly appreciated and the market has fallen, there are likely better places for this capital. Detracting from the portfolio's recent performance were downturns in the business conditions of both Premier Exhibitions and Tesco PLC. The shares of each of these companies have been sold at a loss. Recent negativity in the market has significantly lowered the prices of a number of securities of smaller firms. KVF's portfolio continues to shift towards smaller companies and companies outside of the US, where better value can be found at the present time. Continued market declines will hurt results in the short-term, but would likely be very good for KVF in the long-term. I'd love to get in the KVF fund, very good article, Saj.